Click here for our main index page. The purpose of this policy is to ensure that necessary records and documents are adequately protected and maintained and to ensure that records that are no longer needed are discarded at the appropriate time. It is recommended that each department have an established practice of retaining documents and an annual date for disposing of outdated records. When developing departmental guidelines, consideration should be given to preserving institutional history by identifying materials that are suitable for the University Archives and arranging for transfer of appropriate materials at the appropriate time. The Archives maintains a number of special collections including the papers of journalists such as Jim Bishop, Douglas Edwards, S. L. A. Marshall and Roi Ottley. Many of Thomas Merton's papers are housed here, too. There is a growing collection of biographical and historical material on this site, including transcriptions of some of the documents critical to the history of the University. Much of our collection derives from and depends upon the awareness of the campus community of the historical value of keeping records of its activities. Just as we are often interested in our predecessors' actions at St. Bonaventure, those who follow us here will be curious about our lives at the University. This makes the job of the Archives an active one, gathering evidence of current and recent affairs on campus to provide the research materials for the future. 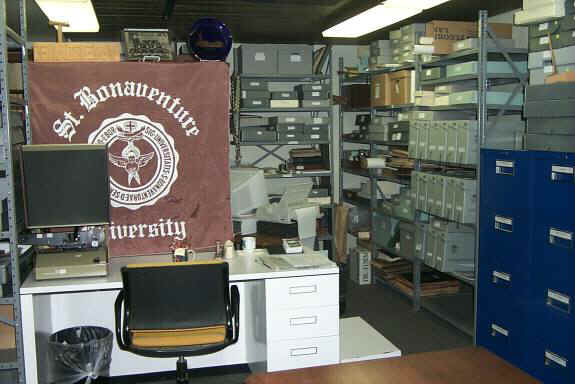 The St. Bonaventure Archives welcomes donations that are related to the University, or are relevant to the curriculum. Of special value to the Archives are St. Bonaventure University publications, final reports of committees and units of the university, records of student and faculty organizations, office records, diaries, faculty publications, class notebooks, and photographs and video. The Site Index provides a comprehensive view of the Archives materials available here. A number of research tools are available on the Web for navigating some of the Archives collections. These include the Google search boxes and the Special Collections site. The Archives' office is located on the lowest level of Friedsam Library, at the far left corner next to the lower level seminar room. Directions to the St. Bonaventure campus may be found here. Summer hours (May-August) by appt.